The alignment looks like a better fit for Temple, which switched from the 3-4 during last season. After playing about half of last season with the 3-4 defense that first-year Temple football coach Al Golden employed with good results as defensive coordinator at Virginia, the Owls switched up and went with a 4-3 alignment during the last five games. "I felt we were better equipped from a personnel standpoint," said Golden, whose team notched its only win in a 1-11 season against Bowling Green in the ninth game of the season, the second game using the 4-3. This spring, Golden is sticking with the 4-3. The Owls, who opened spring drills on Monday and put on pads for the first time yesterday, have been hitting the books for weeks as the defense studies its new formation. For a lineman, the change doesn't figure to require many adjustments. For a linebacker, however, it's a different story. They may see more action as the interior linemen free them up by taking on the guards and tackles. "All plays should be coming to the linebacker," said sophomore Alex Joseph, a 6-foot-2, 228-pound sophomore from Stamford, Conn.
"It doesn't matter," said sophomore nose tackle Andre Neblett. "For me, my responsibilities haven't changed at all. I'll just line up between the center and guard, instead of the guard and tackle." Joseph, who played in 10 games last season, and Neblett were among the nation-high 22 true freshmen who gained playing experience for Temple last season. A safety in high school, Joseph has gained 30 pounds since joining the Owls. He started his college career playing inside linebacker. "In the 3-4, on outside runs, it was good for me to get to the ball," Joseph said. "But [the change] didn't bother me. At that point, my understanding of playing linebacker wasn't as good as I wanted. Now, in general, I'm more aware of the game. As I understand the game, I understand when to fill my gaps. We're still in preseason and in our first day in pads. But right now, everybody is doing good in their assignments. And it's easier now that we are on the field." 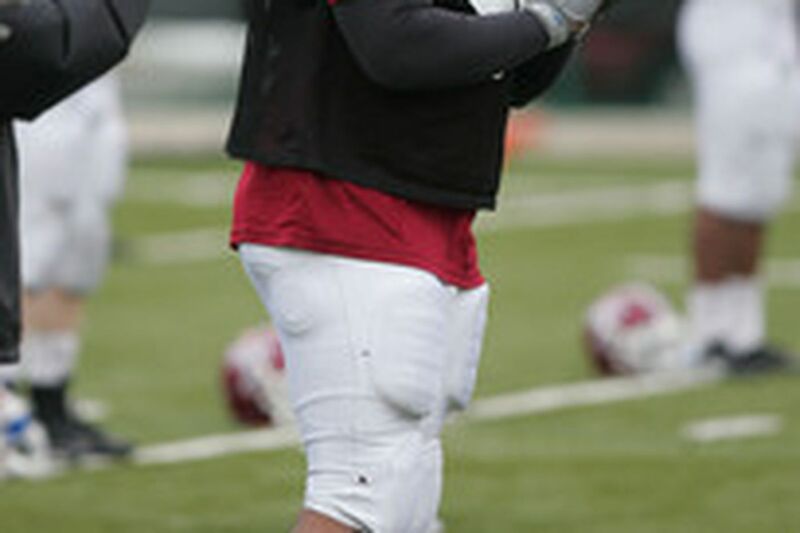 The 6-2, 285-pound Neblett, who is from Rahway, N.J., played in all 12 games and started nine last season. "I'm learning all about balance and using my hands," Neblett said. "There will probably be more contact and double-teams" in the new defense. In making the move away from the 3-4, which is widely used to contend with the spread offenses that have become so popular, Golden aims to take advantage of his squad's speed at linebacker. "Linebackers in the 4-3 don't have to be as big as linebackers in the 3-4," said Golden, who added that a linebacker will often be at the line of scrimmage. "I think the 4-3 is right for us. It suits us. The game of football is about trying to get the numbers on your side, whether by formation or motion. We have linebackers who can run, and I'm excited about the linebackers we have coming in" for next season. Golden, who had a hand in with the Owls' special teams last year, has taken over the job completely. "I had a lot more help last year, but now I'm taking that off of my position coaches," Golden said. "I'm running the special teams, and it's been fun. I'm conducting the meetings, and it helps me to relate to the kids. And it sends the message that special teams are important because the head coach is involved in it." Temple, which opens on Aug. 31 against visiting Navy, will conclude spring drills on April 21 with the annual Cherry and White Day at Ambler Sports Complex. This fall, the Owls will begin their first season as members of the Mid-American Conference.